Cartridge yields approximately 1,000,000 characters. 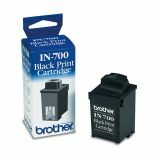 Brother IN700 Ink, Black - Black ink cartridge is designed for use with Brother DP300CJ, DP350CJ, DP5040CJ, DP525CJ, DP530CJ, DP530CJMAIL, DP540CJ, DP540CJMAIL, DP550CJ, DP550CJMAIL, PDP100J, PDP300CJ, PDP350CJ, WP6400J, WP6500J, WP6700CJ, WP7400J, WP7550J, WP7550JPLUS, WP7700CJ. Yields 1 million characters at 12 point.